You may need to add, edit, or delete email accounts. You also might want to fine-tune your email signature (Sent from my BlackBerry) that gets attached to the bottom of each email you send from your Bold. You can add up to ten email addresses to your Bold. Only one can be an Enterprise or Corporate type email address, but the rest can all be personal addresses, such as POP3 or IMAP addresses. Click on your Personal Email Setup icon (may be in your Setup folder). 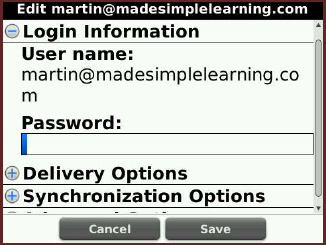 Enter your username and password, if requested, and click Log In. 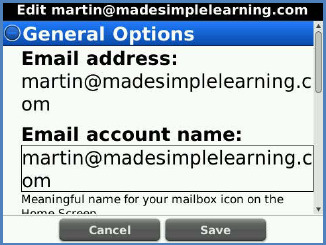 Scroll down to the bottom of the list of email addresses and click the Add button as shown. Follow the steps to add the new account as we described previously. Highlight the icon you want to hide. To change your email account name, password, signature, advanced settings, or synchronization options, you need to edit your email account settings. If you don't use a certain email account anymore, you may want to delete that particular address. Click on the Personal Email Setup icon. Click the trackpad on a particular Email account you want to edit or delete. To delete the account, select Delete from the short menu and confirm your selection. If you are done, press the Escape key to exit to your Home screen. To edit the account, select Edit from the short menu. 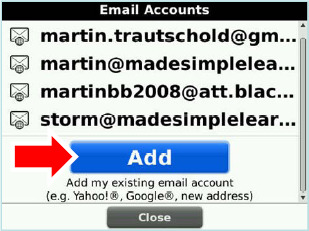 Email account name (the name for the email account icon). Your Name (the name that appears instead of the email address when you send messages, also known as the Friendly Name). Signature (the signature attached to each email you send from your BlackBerry). Usually, you will want to change this from Sent from my (wireless carrier) BlackBerry Device to something more personal, such as your name and phone number or your company name. Scroll down to click on Login Information to be able to change your password for this account. 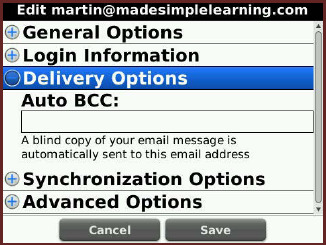 Click on Delivery Options to be able to add an email account to send Auto Blind Carbon Copies of every email you send from your BlackBerry. 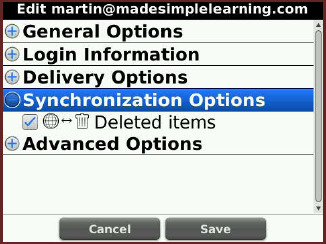 Click on Synchronization Options to adjust whether or not email messages you delete on your BlackBerry are synced wirelessly to also be deleted from your main email inbox. To check or uncheck the box, highlight it and press the Space key. 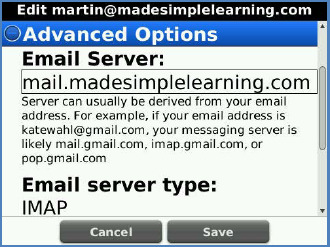 Scroll down to Advanced Options to adjust the Email Server name. Contact your Email Administrator for help if you are not sure about the Email Server name. Scroll down to select whether or not you use SSL (Secure Socket Layer). This is a security protocol that scrambles your email messages for added safety. Contact your Email Administrator for help if you are not sure about SSL. Press the Space key to get the "at" (@) and "dot" (.) symbols whenever typing an email. For example, for sara@company.com, type, sara SPACE company SPACE com. 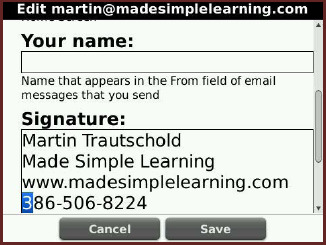 Every email message you send from your BlackBerry will have an auto signature attached to the bottom of it. Usually it will have your carrier name on it. For example, if you use AT&T, then your default auto-signature may say "Sent from my AT&T BlackBerry." To change this signature, you need to follow the steps shown previously in the "Edit or Delete Email Account" section on page 41. If you are not sure of your advanced email settings, open up the mail client on your computer. If using MS Outlook or similar, click Accounts or Email Accounts from the menu. Then, review the advanced settings for that account. If you use web mail exclusively, then contact your service provider to ask for assistance with getting your BlackBerry set up. If you are still having trouble with email setup, then please contact your email service provider or your BlackBerry wireless carrier's (phone company) technical support. 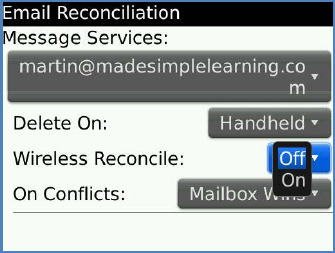 The BlackBerry allows you to turn on or off wireless reconciliation, which is the feature that synchronizes deletion of email between your regular mailbox and your BlackBerry. In other words, if you delete an email on your BlackBerry, you could set it up so that the same email message is also automatically deleted from your regular email account. Usually, this is turned on by default, but you can disable it. If you work at an organization that supplied your BlackBerry to you, this feature may be controlled centrally by your Administrator and may not be adjustable. Some wireless carriers (phone companies) do not support this feature (or don't support it fully) unless your BlackBerry is tied to a BlackBerry Enterprise Server. Hit the Menu key and select Options. Or, press the letter O to jump down to Options. Set Delete On to Handheld. Set Wireless Reconcile to Off. 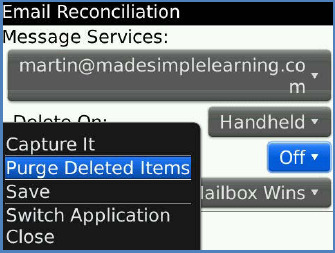 If you want to turn Email Reconciliation back on, set Delete On to Mailbox & Handheld, and set Wireless Reconcile to On. 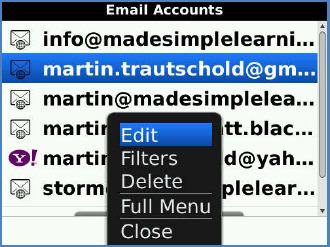 If you have turned on the Wireless Reconcile and want to get rid of old email that you deleted from either your main email inbox or from your BlackBerry, then press the Menu key and select Purge Deleted Items, and then select the email address. If you like to keep your main email inbox (which you view on your computer) cleaned up, make sure to keep Wireless Reconcile turned On. Just use downtime during the day to clean up your BlackBerry email inbox. 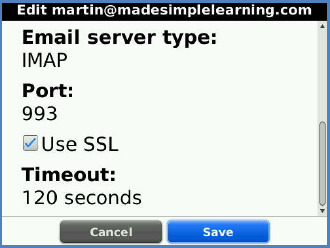 This way, any email messages you delete on your BlackBerry (such as spam or other unnecessary emails), will not appear in your computer's email inbox. It is quite refreshing to come back to a very clean inbox after a day away from your desk.